I need to apologize to the reader for not having written anything during the last few months. They have been months of frantic traveling and activity in the professional front, related to the celebration of the IYCr2014 at the UNESCO headquarters in Paris, January, 20-22, 2014. It was a rare opportunity to re-encounter old friends, colleagues young and old as well as practitioners of crystallography from all over the world. You can find more details of these events at www.iycr2014.org. However, this has been only part of the reason for not being able to write more on the blog. There has also been the effort to pursue a project related to the relationship between the magnificent rose windows in the Gothic Cathedrals of Europe and the symmetry and as follow up, the possible meaning of symmetry. This connection was mentioned in a brief sentence in the masterful book Symmetry by H. Weyl (1885-1955) where he wrote: ‘ Magnificent examples of such central plane symmetry are provided by the rose windows of Gothic cathedrals with their brilliant-colored glasswork’ (pg. 58). The balanced composition, radial symmetry and rich content of the stained glass within the rose windows of the Gothic Cathedrals is apparent to anyone visiting the iconic cathedrals of Notre Dame, Chartres, Reims, Amiens and so many others in France, Germany, England, Italy and Spain. 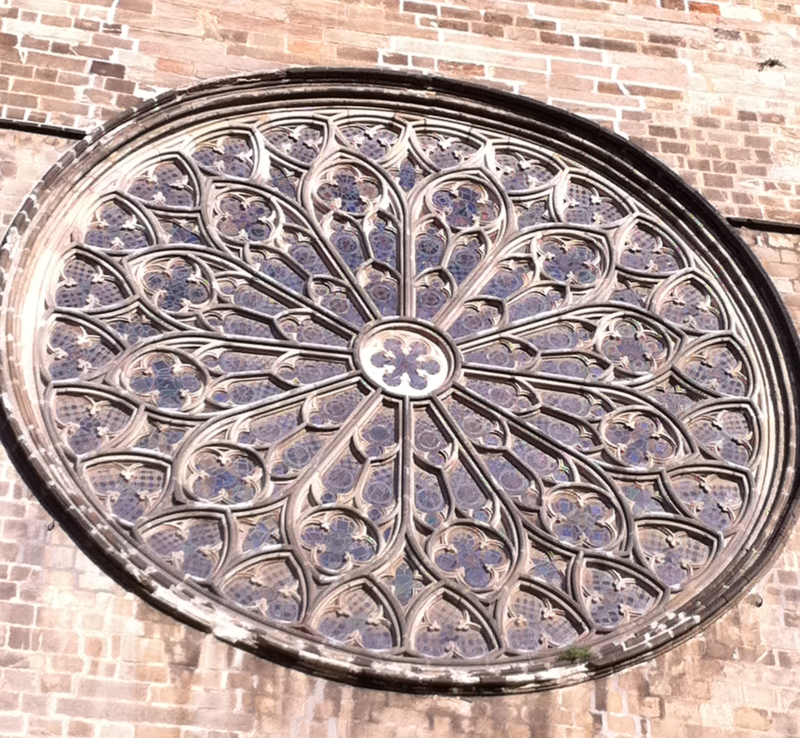 Gothic ‘Rose Window’ in the temple of Santa Maria del Pi (Cita Vella, Barcelona, Spain). The planar point group symmetry of the composition is 12 mm. The history, construction and meaning of these masterpieces of Gothic art have also been the object of extensive studies. During my visit to Paris last January, I was fortunate to meet Mr. Painton Cowen, an authority in the field of rose windows and stained glass with several books to his credit. I was prompted to meet him, talk to him and initiate a possible collaboration with him after I read and studied several of his books. 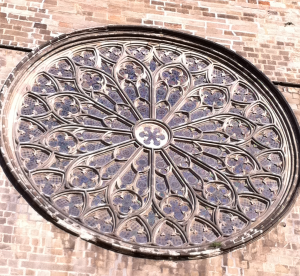 My main point of interest was to attempt to classify rigorously the symmetry of the rose windows and his books and his website www.therosewindow.com, were amazing compendia of information. A preliminary analysis and study of the data illustrated and discussed by Mr. Cowen has been recently published in Acta Crystallographica D (2014). You can access the article at Acta Crystallographica Section D: Biological Crystallography (2014), D70, 907-911(doi:10.1107/S1399004713032859). This brief essay provides a window into the mathematical description of the symmetric arrangements present in rose windows in cathedrals and other monuments of the Middle Ages, and points towards the possible meaning of those iconic masterpieces that represent the legacy of builders, masons, glaziers as well as the societies in which they lived in. After our first meeting in Paris, Mr. Painton Cowen and I are currently pursuing a collaboration to include the rigorous description of symmetry in his website, and to use its analysis to provide further insights into the meaning of symmetry in those iconic pieces of architectural and artistic ingenuity as well as the world-view of their times that they represent. I encourage you to read the entire essay in Acta Cryst D. I will be delighted to hear your comments. This entry was posted in Crystal Edges. Bookmark the permalink.